Get a full smile makeover at our cosmetic dentistry. For a beautiful smile restoration, contact your Westchester cosmetic dentist today. It isn’t uncommon for patients to come into our office with several concerns about their dental health or appearance, which is why we offer full mouth restorations. Full mouth restorations, which are also called reconstructions or rehabilitations, consist of several procedures used to target a range of issues with the teeth, gums, and jaw to improve the form and function of the smile. Good candidates for smile makeovers are people who have many issues with their teeth. These include things like discoloration, extensive decay, gum disease, gum recession, gapped teeth, or a bite that doesn’t line up. Smile makeovers can also be for people who need to replace or correct past dental work. Our Westchester prosthodontist is uniquely qualified to offer smile makeovers. He received years of extra training outside of traditional dental school to master diagnosing and treating a variety of different oral diseases. Prosthodontists also get training in cosmetic dentistry and functional improvement of the smile. 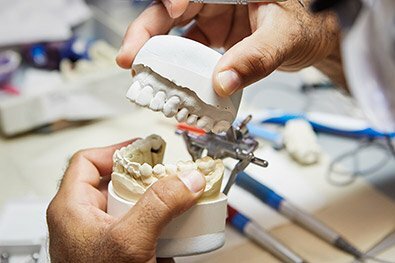 Advanced Dentistry of Scarsdale is a unique practice because we have a prosthodontist, a periodontist, and an orthodontist. Before your Westchester cosmetic dentist orders procedures to improve your smile, they will discuss your dental goals. During your initial consultation, we will talk about the health of your teeth, gums, palate, and bone tissue. We want you to understand which procedures are right for your smile makeover. We can also discuss how to improve your dental health moving forward. We want to protect your investment, and which kinds of anesthetic are right for your reconstruction. After your discussion, your Westchester periodontist or prosthodontist will create a personalized treatment plan for you. Here are a few of the procedures they might recommend. Many people think of orthodontic care as a cosmetic repair. Having straight teeth that fit together can actually reduce head and neck pain. And, it can help you to avoid problems like tooth decay and oral lacerations. If you have crooked teeth, our in-house orthodontist can talk with you about treatments such as spacers, expanders, retainers, and even clear orthodontic systems like Invisalign. Almost half of all American adults worldwide suffer from gum disease. It's a progressive oral health condition that can cause system-wide inflammation. During your smile makeover, we will check for periodontal disease. We may use procedures like scaling and root planing to keep bacteria levels at bay. Dental problems got you down? Get a full smile makeover from our Westchester dentists! If you are struggling with achy or discolored teeth, you may need root canal treatment, to protect the structural integrity of your teeth. During root canal therapy, we will remove the inner pulp of your tooth and fill the interior with a rubberized compound. The tooth is then covered with a crown to improve the appearance and stability of the area. For patients with missing teeth, dental implants may be an option. Dental implants consist of a titanium post anchored into your natural jaw tissue, then capped with a crown. Implants are incredibly realistic, help to prevent more bone loss, and are so comfortable most patients say they feel like their natural teeth. If you have gaps between your teeth, chips, or fractures, we can correct it with dental bonding. Dental bonding consists of composite resins that match the color and opacity of your teeth, creating seamless repairs. Your gum tissue frames your smile, which is why many people who are undergoing a full smile makeover ask about gum grafting and contouring. Gum grafting covers exposed roots, while contouring is the process of shaping existing tissue to create a better look. Full smile makeovers can do more than make you feel great about your teeth. They can also help you to improve the health of your mouth and ward off serious dental issues. At Advanced Dentistry of Scarsdale, we believe in creating a superior experience for our patients. This is why we have in-house lab services and clinicians who are true masters of their craft. Schedule your appointment today to see what we can do for you.